According to data from the North Carolina State Board of Elections and Ethics Enforcement released on November 1, 1,493,453 voters have cast ballots at Early Voting sites since the start of this year’s 18-day Early Voting period. Voters have 3 more days to cast ballots at Early Voting sites, and the final weekend often garners the most traffic. As stated in Democracy NC’s previous analyses of the 2018 Early Voting period, there is no perfect election to use for comparison. 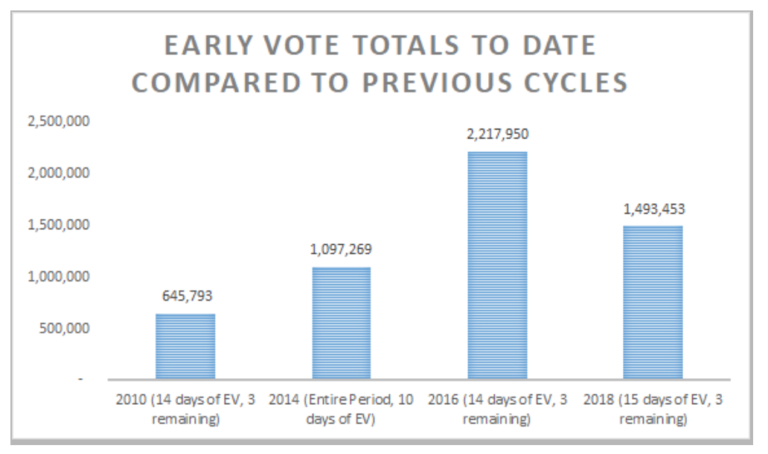 The chart below compares totals for this year’s Early Voting period (15 days completed, 3 days remaining), the entire 2014 Early Voting period (10 days completed), and the 2010 and 2016 elections up to this point (14 days completed, 3 days remaining). This year’s period began one day earlier than the 2014 and 2016 windows. Turnout so far in 2018 has surpassed the totals for the entire Early Voting periods in 2010 and 2014, the last two midterm elections– both of which had Senate races, which this year does not. In 2010, only 645,793 voters had cast ballots at this point in the Early Voting period, and 949,420 cast ballots during that entire 17-day Early Voting period. Across the entire Early Voting period in 2014, which was only a 10-day period, 1,097,269 ballots were cast at early voting sites. At this point in 2016’s 17-day cycle, 2,217,950 ballots had been cast at Early Voting sites. ANALYSIS: "Early Vote Numbers Strong Headed into Final Weekend"
Download Democracy North Carolina's latest look at 2018 election turnout. Following reports of spikes in registration among the youngest voters this summer, voters under 26 have cast almost double the number of ballots (72,030) at Early Voting sites so far this cycle compared to the entire 2014 Early Voting period (37,222). In 2014, voters under 26 accounted for 3.4% of the ballots cast. So far this year, voters under 26 have cast 4.8% of all ballots at Early Voting sites. Across the state, 39% more white voters (1,076,047) have cast ballots at Early Voting locations than during the entire 2014 Early Voting period (776,581), with 3 more days to go. White voters under 26 have cast almost double the number of ballots (44,029) than during the entire Early Voting period in 2014 (22,781). Headed into the final week, Black voters have cast 14% more ballots (321,649) than during the 2014 Early Voting cycle (283,264), while the number of registered Black voters has grown 4% since 2014. So far, Black voters under 26 have cast 37% more ballots (15,188) than during the entire Early Voting period in 2014 (11,052). Black women are 13% up from the 2014 Early Voting period. 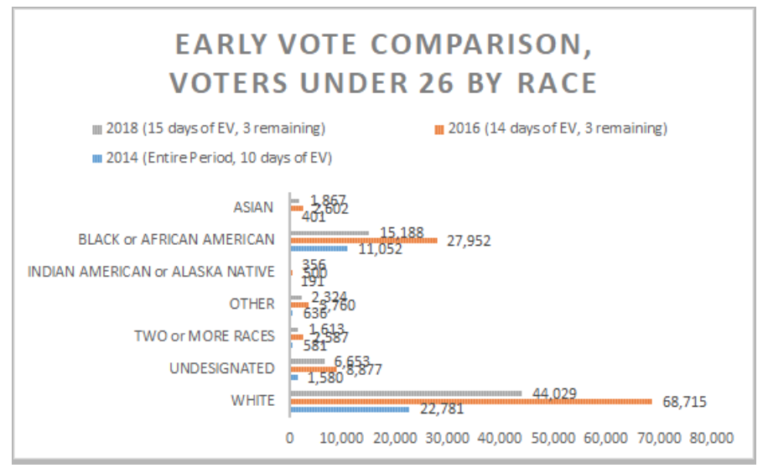 The number of Asian voters who have cast ballots during Early Voting in 2018 (14,958) is almost triple the number cast during the entire Early Voting period in 2014 (5,268), with 3 days remaining. The number of registered Asian voters has increased 42% since 2014. Asian voters under 26 have cast almost 5 times the number of ballots so far in 2018 (1,867) compared to the entire 2014 Early Voting period (401). So far in 2018, 6,995 Native American voters have cast ballots, a 74% increase from the entire 2014 cycle (4,030), which soundly surpasses the 8% growth in voter registration in that time. Native American voters under 26 are up 86% (356) compared to the entire EV period in 2014 (191). More than double the number of Biracial and Multiracial voters have cast ballots at Early Voting locations (6,684) so far than during the entire 2014 Early Voting period (3,106). The number of registered Biracial and Multiracial voters has increased 22% since 2014. Biracial and Multiracial voters under 26 have cast almost triple the number of ballots (1,613) compared to the entire 2014 Early Voting period (581), and make up 24% of 2018 Biracial and Multiracial Early voters. Democratic voters have cast 641,144 ballots so far, a 21% increase from the 2014 Early Voting period total, 531,503. The number of registered Democratic voters in North Carolina has decreased 3% since 2014. Democratic women are up 22% from the 2014 Early Voting period. Republican voters have cast 453,526 ballots so far, a 33% increase from the 2014 Early Voting period total (341,499). The number of registered Republican voters in North Carolina has increased 5% since 2014. Republican women are 33% up from the 2014 Early Voting period. 77% more Unaffiliated voters have cast ballots at Early Voting sites in 2018 (394,884), than in the entire 2014 Early Voting period (222,528), which surpasses the 23% growth in registered Unaffiliated voters in that time. Unaffiliated women have cast 79% more ballots than during the 2014 EV period. So far, Libertarians have cast 3,610 ballots, Green Party voters have cast 171 ballots, and Constitution Party voters have cast 118 ballots at Early Voting sites. Compared to this point in 2014, absentee mail in ballots are 24% up. In 2014, 43,095 ballots had been returned and accepted headed into the last weekend of Early Voting, compared to this year’s 53,495. In 2018, voters under 26 have cast almost double the number of ballots (72,030) at Early Voting sites so far this cycle compared to the entire 2014 Early Voting period (37,222). With 3 days remaining, 83 of North Carolina’s 100 counties have seen more voters so far than during the 2014 Early Voting cycle. Across the state, Wake, Mecklenburg, Durham, Forsyth, and Buncombe have seen the greatest increase in the number of ballots cast at Early Voting sites compared to 2014. 65 counties have surpassed their 2014 Early Voting totals for Black voters, and 80 have surpassed 2014 Early Voting totals for voters under 26. Challenges remain for voters in some hurricane-impacted counties. Of the 17 Counties that are under 2014 totals, 6 of them are receiving federal assistance in the aftermath of Hurricane Florence. About half of the 28 counties receiving federal assistance due to Hurricane Florence have not yet surpassed 2014 Early Voting totals for Black voters. Democracy NC will release another analysis on Sunday, November 4th after the conclusion of Early Voting. These analyses are based on one-stop absentee ballot data available from the North Carolina State Board of Elections and Ethics Enforcement. In the map above, dark green counties have seen the most increases compared to the 2014 Early Voting Period, light green or white counties have seen some increases from the 2014 cycle, and red counties have not yet surpassed 2014 Early Voting totals. Halifax county, seen as dark red above, has only one Early Voting location this year, compared to 3 locations in 2014 and 2016.